Description: Ice Beach offers classic backpacker accommodation at one of the lowest rates in Lonely Beach. We are located 200m away from the beach at the seafront, right next to the very famous and popular Treehouse Restaurant. Description: A new accommodation in Kai Bae beach, Koh Chang. Offering you a simple stay on your holiday. With a high deck and swimmimg pool & surrounding with greenery of tree. Serve good coffee at melanger cafe where our lobby is. 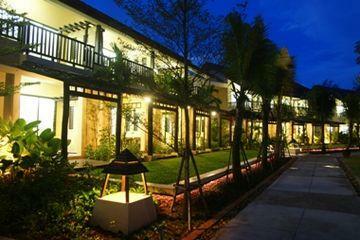 There's Air Condition, warm shower, TV, Refrigirator, Deposit Safe, Free-Wifi and Towel with Clean Bed.